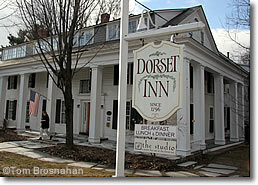 Settled in 1768, Dorset is one of the many villages in New England that is older than the American republic. Dorset, Vermont is a gem of a village, having kept its rural spirit and fine buildings intact over the centuries, and any new structures were required to add to the harmony of the village and its setting. For a number of years Dorset, 7 miles (11 km) northwest of Manchester VT along VT Route 30, was an artists' and writers' summer resort, but these days it is usually only the successful in those fields who can afford to stay in one of Dorset's few charming old inns, and who shop in its old general store on the village green. Rather, the village now caters to those who have become successful in the city, and who need to get away to the peace of the countryside for a few days or weeks. In Dorset the sidewalks are marble, and so is the United Church (1784), a simple structure with Gothic touches just off the town green. The Dorset Playhouse, just beyond the church, draws crowds year round for its big-name performers and innovative, professioal-quality productions. The oldest marble quarry in the USA (1785) is about a mile south of the village green: look for the historical marker and large blocks of marble on the northeast side of the road. Besides supplying the soft, easily cut stone for a myriad of uses in Dorset, the quarry supplied most of the marble for the New York Public Library building. On the way to the quarry you'll pass the J K Adams Company Factory Store, on Route 30 a mile south of town. J K Adams makes fine wood products—carving boards, butcher blocks, kitchen worktables, even kitchen organizers like a spice block that holds 16 glass jars and revolves on a lazy susan. All the items are available at a reduced price, and the "seconds" are sold at prices up to 40% off the norm. 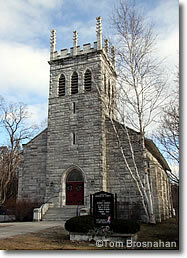 Above, the marble United Church (1784).